If you are hoping for some fantastic shots of this Tadao Ando building, don’t go on a rainy day – the grey skies won’t do it justice and there is no shelter for you and your tripod while you set up the shots. A clear Autumn day would be good as you need sunlight to make the most of the angles and reflections. Plus the surrounding greenery showed promise of changing colours in early October. A day with blue sky might be too postcard perfect. Allow an hour or so to travel from Okayama. Take a JR train to Bicchu Takahashi station and then the bus from Bay 2 to Nariwa Bus Terminal. At Bicchu Takahashi station, the bus terminal is on street level below the Library – and Starbucks – entrance. The buses run about every forty minutes and are the usual deal where you take a ticket as you enter through the back door and drop your fare in the slot beside the driver as you alight. At Nariwa Bus Terminal (a toilet block and souvenir shop), stand with your back to the souvenir shop entrance, look straight ahead, and the white building on your left is the Nariwa Museum. The guide books say it is a six minute walk but that includes the long trek from the building façade to the entrance. 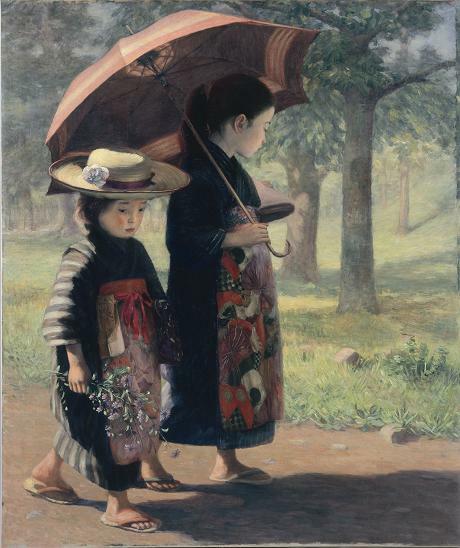 The Museum houses a collection of 19th and 20th Century work by Japanese artists who followed a western tradition. There are some commendable paintings by Torajiro Kojima. The shadow in this one is exquisite though the colour in the reproduction is not quite right. As well as artwork, the museum shows artefacts from Asia and Egypt that Kojima collected on his travels. Fossils from the area are displayed in a separate gallery. The shop offers pancakes and sweet treats, along with hot or cold coffee, tea, and other refreshments. The toilet on the ground floor is worth a visit. Toilet adjacent to the shop at the Nariwa Museum. Catch a local train on the return journey and you’ll see a lot of villages and farming plots. Hop off at Kurashiki if you’d like to wander through the Bikan Historical District which is well signposted from the station. On a pleasant day, it’s an easy walk from there to the Ohara Museum which also has work by Kojima. Both Nariwa Museum and the Ohara Museum are closed on Monday.